The scandal erupting around the Getin Noble tapes could have significant consequences for the Polish financial system. Marek Chrzanowski, Head of Polish Financial Supervision Authority (KNF) announced his resignation in the aftermath of corruption accusations. That a body as important in regulating the key financial institutions in the land might be open to influence could rock the belief of investors in the stability of the financial system. Credit rating firms, who have so far assessed the health of the financial system and its independence very highly – even when they have had concerns over other aspects of the governance of the country – will be watching carefully how the government deals with these allegations. The KNF is a body which wields a lot of power. According to its statute, it “exercises supervision of the financial market”, including banking and the capital market, as well as insurance and pensions. It can audit an institution as often as it likes, it can impose fines, as two examples this year have shown, by up to PLN 40 mln (EUR 8 mln). It can also blacklist an organisation, agree to a merger or grant a licence. So when a bank chairman like Getin Noble’s Leszek Czarnecki is summoned to see the chairman of the KNF, he makes sure he turns up. According to allegations, the chairman of the KNF Marek Chrzanowski made an offer to prevent KNF intervention which could potentially lead to the collapse of Getin Noble bank. The suggestion was that the bank could then be taken over by one of the company’s two largest financial institutions for a single złoty. The conversation in which the offer was made was caught on tape made during the meeting which took place on March 28 by the Getin chairman. His high-profile lawyer Roman Giertych a former ultra-nationalist politician at one stage allied to the current ruling party. Now, he represents many cases in which main opposition party figures are involved. Mr Giertych gave the transcripts to the prosecutor’s office in Warsaw on November 7. The “Gazeta Wyborcza” daily published them on Tuesday. In addition to its chairman, who is elected for a five-year term, the KNF’s board also has representatives named by various ministries, and the head of the National Bank of Poland, as well as a representative of the country’s President, Andrzej Duda. According to the tape transcript, Mr Chrzanowski said he would arrange the removal of the President’s appointee to the board, who was the main proponent of the KNF’s “high-risk” assessment of the bank, which had been very costly over the past year, and taking it over for a song when it would eventually go bankrupt. In return, according to the tape transcript, he suggested that Mr Czarnecki engage the legal services of a legal firm, belonging to a member of the board of the Warsaw Stock Exchange. The KNF chairman is alleged by Mr Czarnecki to have written on a piece of paper the sum of “one percent”. According to the information sent to the prosecutor, Mr Czarnecki’s lawyer was proposing a fee equal to one percent of the company’s market capitalisation, which in March would have been PLN 40 mln (around EUR 9 mln). However, the word quoted on the transcript was “wynik” ie profit. In the first quarter of 2018, one percent of the bank’s profit would have been equal to less than EUR 1 mln, which sounds much less dramatic than what Mr Czarnecki’s lawyer was suggesting. The main shareholder of Getin Noble bank and Idea bank is the colourful Leszek Czarnecki, who has made his mark on the Polish domestic financial market and has now settled in the United States. His 60 percent shareholding is through LC Corp BV registered in The Netherlands. Czarnecki and Getin Noble are 81 percent shareholders in another bank, Idea Bank. GetIn Noble, founded in 2004 has 239 branches and in 2017 made a loss of PLN 574 mln (EUR 130 mln). It is quite far down the list of top banks in Poland according to assets at number nine, but it has found itself in trouble in recent months, needing recapitalised in order to to deal with various struggles of late. The bank has been under pressure because of its large portfolio of higher risk mortgage loans granted in foreign currency in the run-up to the 2008 financial crisis. It has been restructured over the past year, ridding itself of part of its portfolio. For from cleansing itself of problems by selling off debt portfolios, the Getin Group has found itself under pressure because the purchaser of much of its bad debt was Getback, a company which was spun off from the Getin group some time ago, but which has itself been embroiled in scandal for having paid way over book value for debt, making colossal losses in the process which it allegedly masked by issuing bonds that it could not service. It is currently suspended from trading and seeking an accord with its creditors. 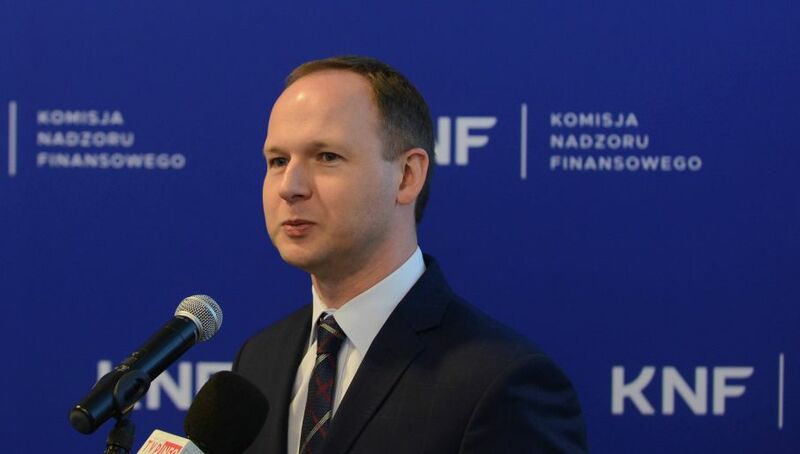 Before being appointed as the Chairman of the KNF in October 2016, Mr Chrzanowski, aged 37, was a member of the Monetary Policy Council of the NBP, a position he occupied for seven months. Prior to that, as a senior academic at the prestigious Warsaw School of Economics, and head of the National Economics Institute, he was appointed as the chairman of Andrzej Duda’s National Development Board in 2015.